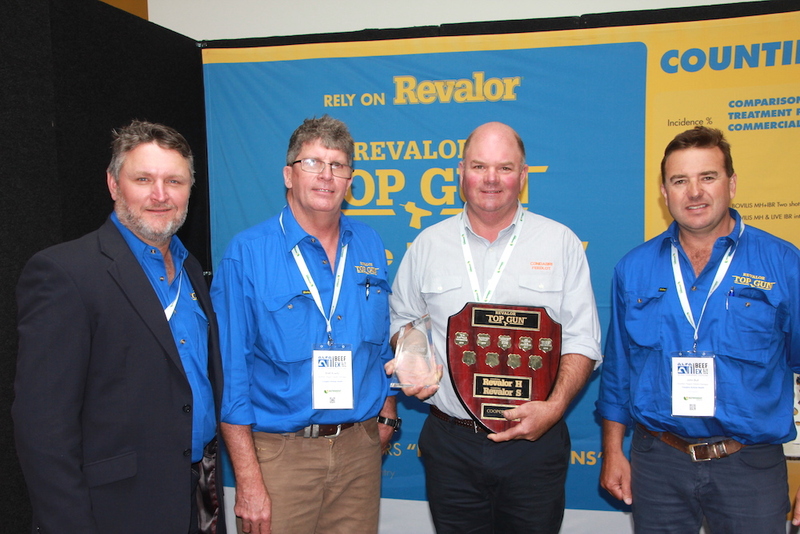 Coopers’ Rob Baines, Brett Kowitz and John Bull congratulate Simon Drury, Condabri Feedlot, Condamine, on the its success in the 2018 Top Fun competition. THE Drury family from the Condabri Feedlot between Miles and Condamine has taken out the 2018 Coopers Animal Health Revalor Top Gun program, with an impressive 99 percent success rate across 400 audited implanted cattle. The Top Gun competition has been run by Coopers since 2014 to promote the economic and welfare benefits of best-practice HGP implant procedure. In the Top Gun competition each participating feedlot must submit 100 cattle per quarter for testing by a Revalor representative. At the end of the fourth quarter the winner is the feedlot team with the highest score out of 400. Scores reward good preparation, placement, hygiene and implant retention. The competition gives feedlots an opportunity to benchmark their own performance and reward induction teams that deliver consistently strong results. The Condabri Feedlot team took out the 2018 competition with a score of 396 out of 400. Revalor representative Brett Kowitz said implants can have a high return on investment and the goal of the competition is to encourage feedlots to train induction crews to achieve the best possible results from the investment. “This is the fourth year of the competition and what is encouraging for us is the enthusiasm and the competitiveness of all the feedlot induction crews in the competition,” Mr Kowitz said. In the four years of the competition the Condabri team has progressed from an 87pc audit result in the first year to scores consistently above 95pc every year since, reflecting a concerted effort to lift the standard of implant technique. “It is thanks to Coopers and to Brett who has been coming out to our feedlot for quite a few years,” Mr Drury said in accepting the award. “We thought we were legends when we were getting 80 something percent. Taking second place in a tie on 394 points was Associated Feedlots from Mathoura, NSW and MDH’s Wallumba Feedlot at Condamine, which neighbours Condabri. In third place was the Morgan Pastoral Company’s Kurrawong Feedlot from Quinalow near Dalby, one of the four joint winners in 2017. 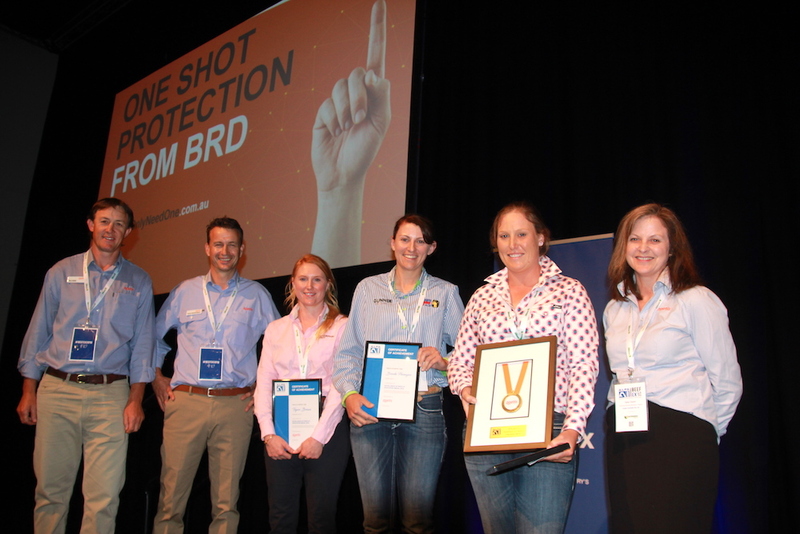 Zoetis Excellence in feedlot education medallist Jane Reid (second from right), with fellow finalists Tegan Brown and Brook Flanagan, and Zoetis’ Stuart Metheringham and Sally Oswin. The 2018 Zoetis Excellence in Feedlot Education Medal has been awarded to Jane Reid, leading hand at Teys Australia’s Jindalee Feedlot, Springdale, NSW. The long running Zoetis Medal was established in collaboration between Zoetis, ALFA and the New England Institute of TAFE to recognise excellence in feedlot operation skills and the value of accredited training in the feedlot industry. The medal is designed to acknowledge and reward feedlot staff who are commited to continual accredited learning within the industry and to encourage sraff to regard the feedlot industry as a worthwhile and rewarding career. The application process is open to anyone who is currently enrolled or graduated after July 1 2017 from accredited teritary education relevant to the feedlot industry. To qualify for the 2018 Zoetis medal applicaiton process candidates had to have been employed at a feedlot since before July 1 2017. Applicants are interviewed in their place of work by representatives of Zoetis and ALFA. This year’s winner was Jane Reid who has worked her way up to the role of leading hand at Teys’ Jindalee Feedlot, looking after a livestock crew of 9 staff. Sally Oswin said Jane impressed when leading a feedlot tour component of a recent ALFA welfare workship. Jane is currently studying to receive a Certificate III in feedlot operations. The Runners-up in this year’s competition were Gundamain Feedlot’s Tegan Brown and Gunnee Feedlot’s Brook Flanagan. Three finalists each received an OzTrail Swag and as the overall medal winner Jane also received a $500 cheque plus the chance to participate in ALFAs 2018 Margin and People management program.